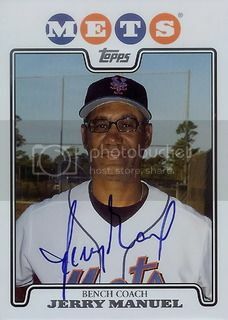 This Jerry Manuel card came out of the 08 Topps New York Mets 55 card team gift set. I mailed it off to him a few months ago and was glad to get it back signed just before his time in New York came to an end. 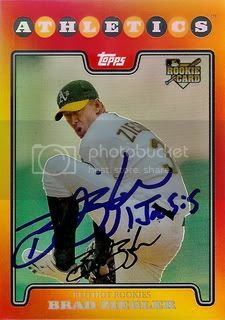 Here's another card we got signed during Spring Training this year but didn't post right away. 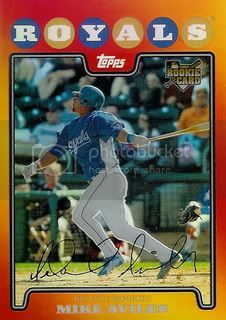 Luis Mendoza signed his 08 Topps Chrome card for us. I stumbled upon these six cards on eBay. Initially I was a little baffled as to what they were. I had no idea gold bordered rookie variations existed. A quick Google search led me to one of my favorite blogs, bdj610's Topps Baseball Card Blog. 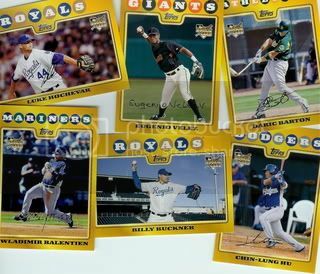 I learned that they are part of a thirty card set that were exclusively offered through K-Mart blasters. Pretty cool. Raiderdan from SweetSpotGraphs.com also sent us our second All-Star jersey card from the 08 Topps U&H set. 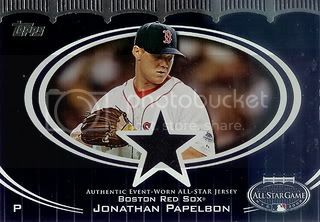 This one is of Boston Red Sox closer, Jonathan Papelbon. Another great card for our 08 Topps collection. Thanks to eBay I was able to pick up a few of the 14 card 2008 Topps team sets. 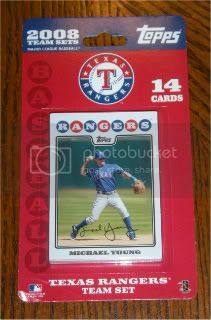 The lot I won included a Texas Rangers set. 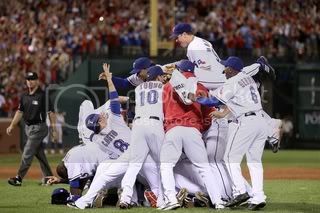 Yes, the 2010 American League Champion Texas Rangers! Nothing to say but... Go Rangers! 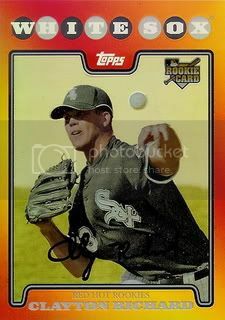 Over the weekend we posted a few Red Hot Rookies cards that our friend Raiderdan from SweetSpotGraphs.com sent us. He also included a few signed 08 Topps cards for our set. The final card is of former Chicago Cubs pitcher, Rich Hill. 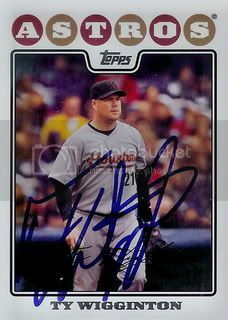 The second is of 2010 American League All-Star, Ty Wigginton. 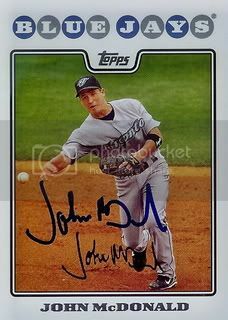 The first is of Toronto Blue Jays infielder, John McDonald. Our friend, Raiderdan, from SweetSpotGraphs.com usually helps us out with signed cards from players who pass through the International League. This time he hooked us up with two Red Hot Rookies cards. The second is of Kansas City Royals infielder, Mike Aviles. This is our fifth Red Hot Rookies card. Only 15 more to go! 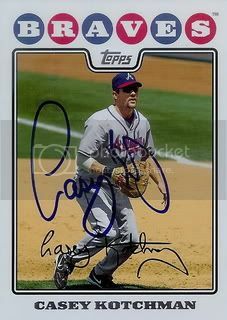 The first is of former Chicago White Sox and current San Diego Padres pitcher, Clayton Richard. If all goes well, we should be able to get this one signed during Spring Training next year. You may remember this post from last December. 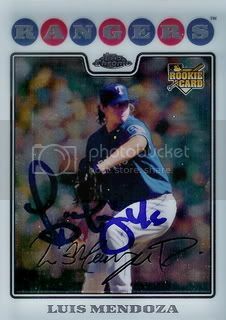 Back in February we were able to get Taylor Teagarden to sign his 2008 Red Hot Rookies card. Looking at these again, I'm remembering how much I like this set. I'm going to have to try to get the rest of them. 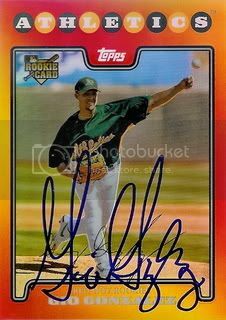 Back in February we were able to get Gio Gonzalez to sign his 2008 Red Hot Rookies card. Gio put together a pretty great 2010 season. He's always been a great guy and I'm happy to see him succeed. 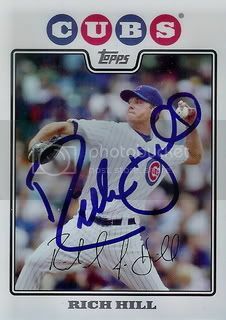 Back in February we were able to get Brad Ziegler to sign his 2008 Red Hot Rookies card. Brad signed a ton of autographs the day we saw him. Great guy! 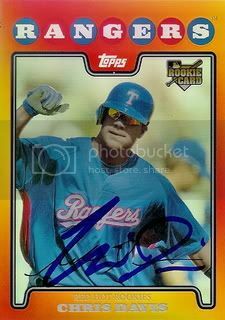 Back in February we were able to get Chris Davis to sign his 2008 Red Hot Rookies card. These cards are pretty awesome. It may be October but I'm bringing back a little bit of February by catching up on a few cards I got signed during Spring Training but didn't post right away. 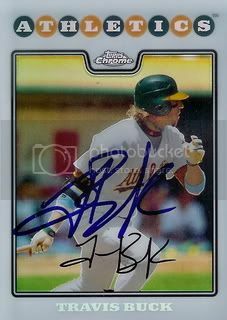 We already had Travis Buck sign his regular 08 Topps card so this pas Spring we had him sign his Refractor from the Chrome set. Thanks to eBay I was able to pick up a few of the 14 card 2008 Topps team sets. 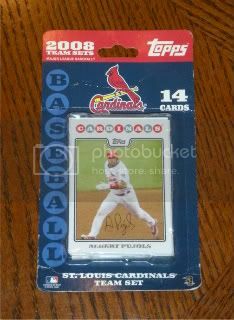 The lot I won included one St. Louis Cardinals set. 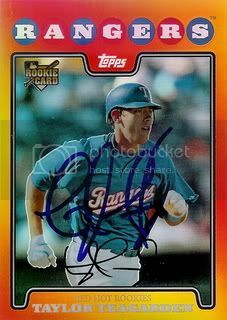 On Saturday we posted the refractor that Casey Kotchman signed for us. Well he also signed his card from the Updates & Highlights set too. Thanks, Casey! Good TTM return today. 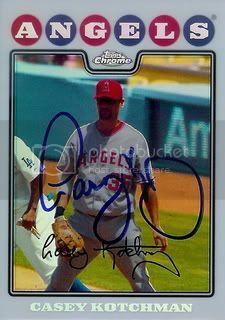 Casey Kotchman signed his refractor from the 08 Topps Chrome set. This card is pretty awesome. 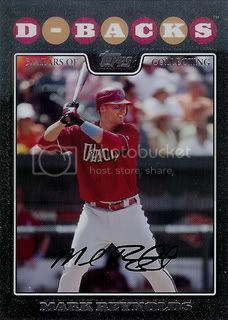 The same day I posted the Eric Bruntlett black border parallel, I won this Mark Reynolds card. Pretty cool. 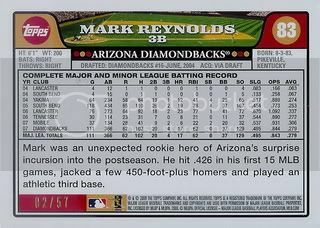 Hopefully I'll be able to get it signed at the 2011 Diamondbacks Fan Fest.